The Taylor Baby Taylor is a great guitar for beginners and traveling musicians. Taylor believes that just because a beginning guitarist is young does not mean that they should play anything less than a top quality guitar. To this end they have created the Taylor Baby Taylor, an awesome kids acoustic guitar. The quality of this piece is astounding. It has a solid mahogany top and sapele arched back and sides that give this ¾ scale guitar a sweet, clear sound with an emphasis on the midrange notes but without skimping on the fullness of the treble or bass notes either. The ¾ scale size and slim neck give this pretty baby easy handleability for smaller hands and its $299 price tag means that parents won’t be discouraged by a large financial investment. The clear tone and easy handling mean that the child will be more likely to keep up with their practicing, and will not become discouraged by the soupier sound produced by cheaper acoustic guitars. Looking for child guitar with a little more feminine design? 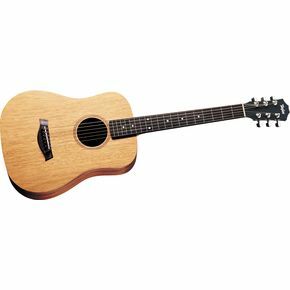 - consider the ¾ size Taylor Swift Signature guitar with a delicate rosette pattern as an alternative. While the Taylor Baby Taylor does not provide as full a sound as the larger Taylor models, the reduction in loudness and projection is not a steep price to pay for a guitar that gives the beginning guitarist such a boost in self-confidence.